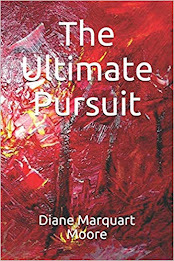 I've known for some time that Pinyon Publishing had scheduled the publication of the work of one of my favorite Pinyon poets, Michael Miller. Today, I received a copy of Lifelines, Miller's newest book of poetry, and the book is all that I expected to be—an ardent and profound collection of poems that can be read quickly because there is an immediacy and a strong flow of language in his work. 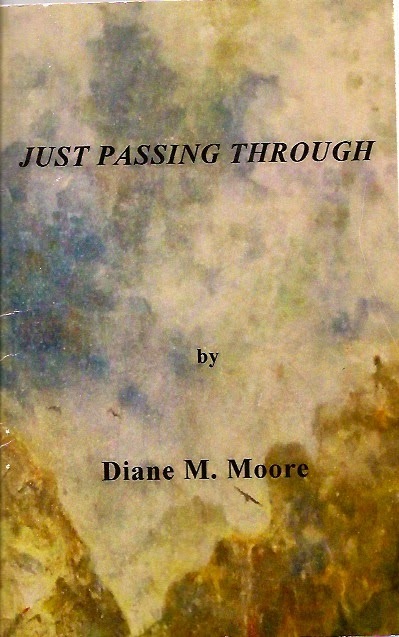 The poems probe the serious subject of mortality, love, marriage, and family, touching on the truth with good-humored intensity and expressing wisdom gained from past losses, as well as resilience in the face of fierce fear. I read aloud most of the poetry to a friend, and she agreed that Miller is a major poet who has captured the great themes of poetry with poignance and grace while conveying the suffering and loss inevitable in the human condition. "Hooks and Eyes" is one of the eminent poems in the section of Lifelines devoted to family relationships. It is a poem about the author's grandmother, a moving and ironic piece that recalls the era when polio threatened the American family: "Do you want to be in an iron lung? "/My grandmother asked,/Ordering me to wash my hands/As that crippling disease/Spread like the war in Europe./Fear became my bullying foe,/Stalking me through summer,/Dragging its steel braces/With black leather straps..." The imagery in the last three lines startles the reader with its awful threat, and I shuddered at the remembrance of one awful summer when the disease struck a friend of the family in hot, swampy Louisiana where diseases often fester during sultry weather. Miller rescues the reader from further awfulness with a cameo of his grandmother in the second part of the poem: "Through the crack in the door/I watched my grandmother adjust/Her pendulous breasts inside the corset./I wanted to pull the long laces/Through the hooks and eyes,/To feel it snug around my body." 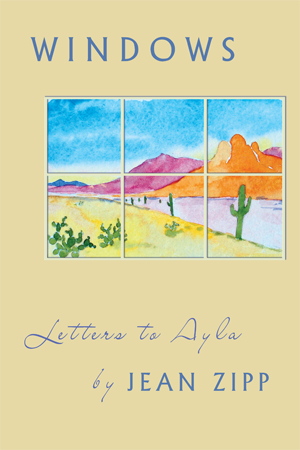 Those clean, simple lines enfold the reader with the author's deep-felt affection for his grandparent and show his ability to express that affinity without the mawkishness of a less-disciplined poet. Simplicity and clarity are paramount in Miller's lyrics and are evident in the brief depiction of an obviously "special" newspaper carrier. In "Lighting The Way," Miller writes: "Headlights, twenty yards behind him,/Brighten the tree-lined street/Where he walks briskly at four a.m./Tossing The Berkshire Gazette/Onto the doorways of dark houses/With only his mother lighting the way./On his fortieth birthday he insisted/He would do it alone; his mother let him./From the window I watched/His chunky body in shorts, his flashlight/Lighting the pines, the porches./In his Red Sox's T-shirt/He lumbered forward as if to declare:/I have a life, I have a good life,/I am Alvin Kipple delivering your papers." 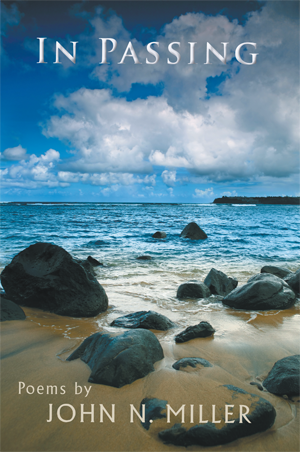 The tone of the poem and description of the carrier evoke moving images of Forest Gump who captured the sympathies of moviegoers in the film of that name. "Lighting the Way" is the poet's clear-eyed view of a person with limited capabilities who has the determination to work and live a dignified life. Miller is a master at expressing the ambivalent feelings of married couples, and in the poem "A Lasting Marriage," he again explores uncomfortable aspects of the married state, providing a wise reflection about the depth of long-term commitments: "Now we love deeper, deeper/Than the rage that never crossed/The invisible border into violence./Our lips touch with a softness/Of petals opening into another spring./And although we are old/We join with the half-life/Of an unforgotten passion,/The flow between us/Passing over every stone." Michael Miller's gifts of observation and psychological acuity have provided readers with unforgettable lyrics about the frustrations of life and the inner changes that take place within humans. 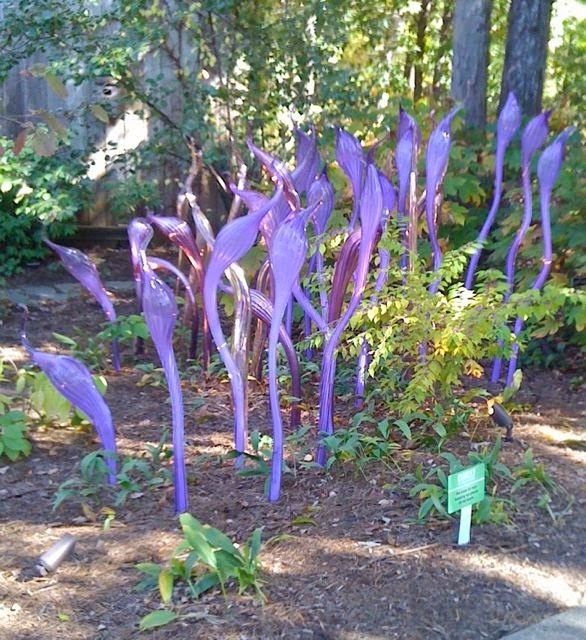 He has imbued them with a dignity that creates significant emotional responses in all who search for "lifelines." As I said earlier, Lifelines is all that I expected it to be—another triumph from Miller's pen and from the poetry corner of Pinyon Publishing. The beautiful cover art of Lifelines was done by Susan Elliott who designs all of Pinyon's book covers. Miller's poetry has appeared in The Sewanee Review, The Kenyon Review, The Southern Review, Raritan, Pinyon Review, and The Yale Review. His poem entitled "The Different War" was the 2014 First Prize winner of the W.B. Yeats Society Poetry Award. He lives in Amherst, Massachusetts. 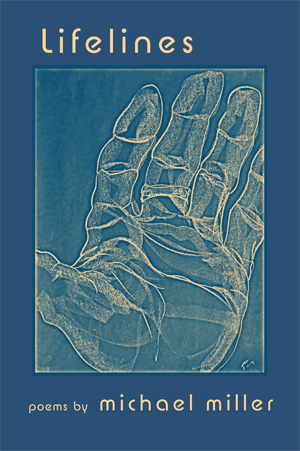 Lifelines is available from Pinyon Publishing, 23847 V66 Trail, Montrose, CO 81403. 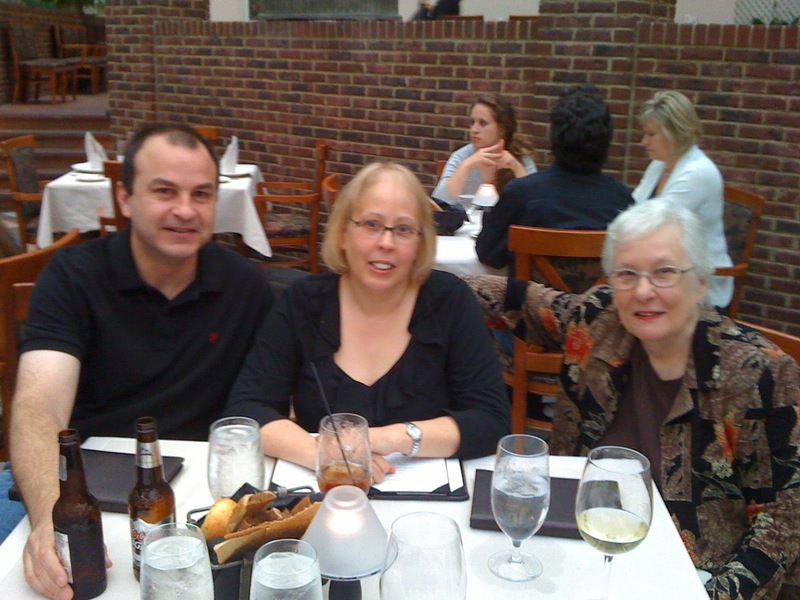 A few years ago, Anne Simon, a retired district judge in New Iberia, Louisiana, shared with me the news that she had been writing short stories and novels for many years; however, I had to wait several more years before she allowed me to read any of her writings. I knew that she had written many articles and briefs in her practice as an attorney and a judge, and I was prepared to read well-written prose, but what I found was polished creative writing that reminded me of the late Erle Stanley Gardner's Perry Mason series. 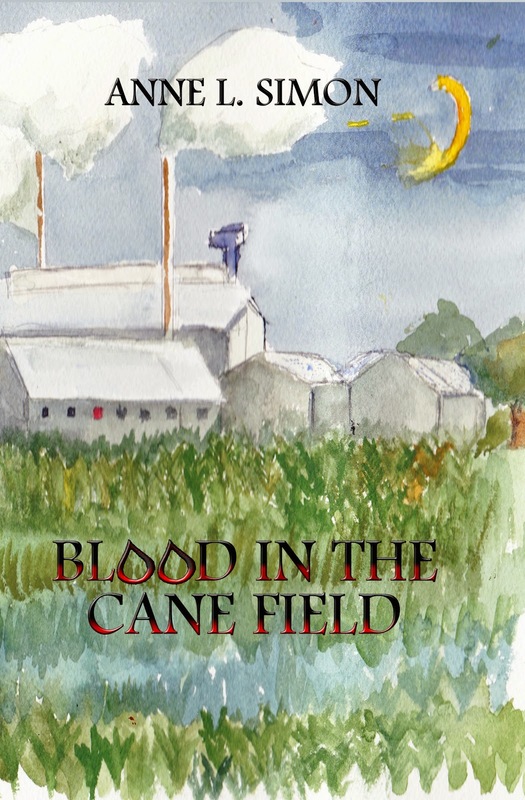 Last month, Anne's crime novel, Blood in the Cane Field, made its debut, and I suspect that it will become a runaway publication, perhaps a candidate for the Mystery Writers of America's Grand Master Award. This crime fiction publication, the first in a planned series of crime/courtroom stories, features murder and courtroom action that reflect Anne's legal and investigative abilities, as well as her experience as a noteworthy judge in south Louisiana. The opening scene of Blood in the Cane Field reveals two bloody bodies lying in sugar cane stubble, discovered by a Texaco oilfield worker's dog, Praline. The action moves from this bloody scene to the narration of Public Defender John Clark III who becomes engaged in defense of Danny Howard, a surly, depressed teenager who has spent his first years of life at the edge of the Atchafalaya Basin in south Louisiana and who has been a participant in a party with the two murder victims. Danny is suspect because of his angry responses to racial slurs made about his dark skin, although he insists that he is white. As the Public Defender investigates the murder, he discovers the teenager's true parentage and attempts to counsel both the teenager and his mother. The plot centers on Danny's confrontation with the death penalty twice and John Clark's investigation and attempts to keep Danny off Death Row. When John finds major exculpatory evidence in similar killings that have taken place in a nearby parish, the plot becomes highly suspenseful. Romance is interwoven in the story via the appearance of Medley Butterfield, a Mississippi woman with a questionable past, and John falls in love with her despite his resolve not to form a committed relationship. The couple uncovers evidence of political corruption and underground criminal activity that places Medley in danger, and the surprise denouement will delight those who like to see good legal representation/investigation rewarded and romance problems resolved. Names indigenous to Cajun country are sprinkled throughout the novel and are reflective of the nicknames that Cajuns often assign to their offspring: "Ti-Boy," "Snap-Dog," "Nee Nee"... Although Anne grew up in New Jersey, it's obvious that she feels strong affection for her adopted home in Louisiana, and she accurately depicts colorful folk aspects of south Louisiana culture in this piece of crime fiction. Blood in the Cane Field is an amazing first book in her Blood Crime series and signals the debut of a noteworthy Louisiana writer. It's a page turner—336 pages of fast-paced fiction! Anne Simon was educated at Wellesley, Yale and Louisiana State University Law Schools and practiced law with her husband, raised a family, then became the first female judge in the Acadiana area. Brava Anne! May your book writing become so voluminous that it exceeds Erle Stanley Gardner's 80 Perry Mason novels! At least every two years, my daughter Stephanie and her husband Brad come up to The Mountain at Sewanee for a tour of Tennessee, preferably Nashville, as Brad is a guitar enthusiast and likes to visit the guitar shops. Stephanie is a big country music fan so we spend Saturday evening at the Grand Ole Opry. En route to Nashville, we veered off course at Bell Buckle, moon pie capitol of Tennessee (and probably the world!) to eat lunch at the famous Bell Buckle Café in a town that boasts a population of nearly 400 people. It's also known for the famous Webb School, which has turned out a passel of Rhodes scholars. My godfather, Markham Peacock, attended Webb School during his high school years under the supervision of founder "Sawney" Webb and traveled from his home in the Mississippi Delta to Bell Buckle on a train that was called "The Dixie Flyer." After lunch when we continued our en route search for serendipity, Brad went into the Gallagher Guitar shop, home of world class guitar makers, which is housed in a nondescript brick building on the main street of Wartrace, (population 600). As we wandered around the "hub" of this small town, I noticed a sign labeled "The Dixie Flyer." 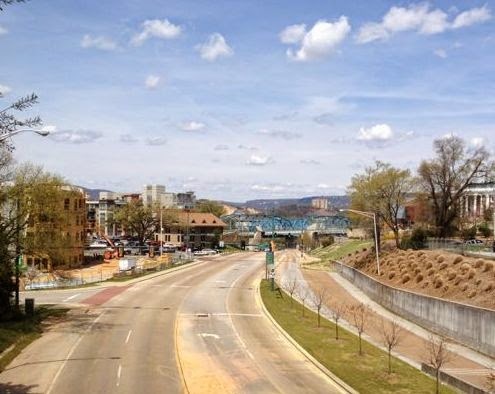 It was located trackside on CSX's Nashville-Chattanooga mainline where 25 trains whiz past daily. I'm an inveterate train lover and lingered in five rooms containing operating HO, N, and O gauge model trains and railroadiana where I discovered a framed photograph of the old Dixie Flyer on a wall in the front room of this shop. It rode on the seat beside me while we toured Nashville every day! For starters, the Nashville visit centered on the Grand Ole Opry, but we stepped into another culture when we toured Cheekwood Botanical Gardens and Museum where we viewed a fascinating display of contemporary Japanese Bamboo Art organized by the Clark Center for Japanese Art and Culture and International Arts and Artists. The exhibition contains 38 works of 17 contemporary bamboo artists and masters of woodblock printing. The selections in the woodblock display were from the era of shin hanga, which focused on the images of fashionable women, sometimes depicting them in landscape scenes. Shin hanga was an artistic form used in Japan from the 1800's until the middle of the 20th century, and the Bamboo Art Exhibit rivaled the Chihuly glass sculpture outdoor exhibition we had viewed at Cheekwood several years ago. For me, the highpoint of the Nashville visit was the Frist Center for the Visual Arts, which occupies a historic landmark—Nashville's former main post office built in 1933-34. The Frist Center is housed in a building reflecting classical and Art Deco style architecture and was constructed with a goal of providing permanence and stability, but the construction was streamlined with cast aluminum doors and grillwork, colored marble and stones on the floors and walls. The old post office, built during the administration of Herbert Hoover, was purchased and restored during the 80's through the efforts of the Metropolitan Nashville government and Dr. Thomas Frist, Jr. The majority of it is rented to the Frist Center for the Visual Arts, which opened in 2001. The exhibits we viewed included Steve Mumford's War Journals, the work of a New York-based artist who visited occupied Iraq and war zones in Afghanistan, capturing in drawings, watercolors and journals the figures of Allied soldiers and people living and working in that area of the Mideast. He spent ten years recording life in a war zone, and some of the renderings show wounded civilians and soldiers being treated in the Baghdad Emergency Room or receiving therapy at medical centers in the U.S. The sketches of war zones are stylistic, personal renditions that extend to images of the prisoner detention camp at Guantanamo Bay, including the abandoned Camp X-Ray where prisoners were subjected to interrogation techniques such as waterboarding. The entire exhibit was a haunting depiction of war and its horrors. We also saw an exhibit of Francisco Goya's 81 prints depicting the Peninsular War of 1808-1814 between Spain and Napoleonic France—etchings that focused on the negative effects war has on ordinary soldiers and civilians. Although Marty Stuart is known as a country music star—one that I enjoy—he has been photographing people and places in the South since he first toured with bluegrass performer Lester Flatt at the age of 13, and the third exhibit we saw contained photographs that reflected his surprising talent for visual art. Perhaps the most arresting photograph was the portrait of Johnny Cash shortly before his death, a portrait that portrayed the icon of country music with a dignified expression on his battered face much like that of a Puritan preacher. On May 18, we celebrated my 79th, compliments of Brad and Stephanie, at Ruth's Chris Steakhouse, but we all agreed that although Tennessee offers premier steak and barbecue, its bread pudding couldn't equal Cajun country's version of this dessert! June is fast approaching, and I'm pondering whether the summer months on The Mountain here at Sewanee will be dry ones this year. 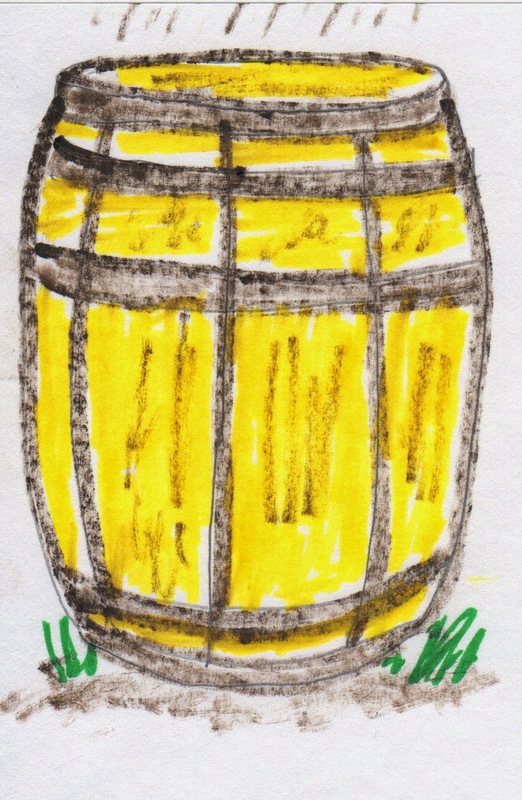 It's a thought to ponder because water is scarce here when droughts occur, and we don't own any rain barrels or cisterns to help us through the hot periods. The lawn became parched and my flower garden perished the second summer we lived here because we didn't water—the first summer we naively watered our vegetation, and the bill for June came in bearing the news that we owed the local utility company $237! Ouch! This notification brought forth a poem entitled "The Cost of Water" published in Just Passing Through in 2007. I'll include it at the end of this blog. Meanwhile, I read in our local newspaper, The Sewanee Messenger, that a UT extension agent is sponsoring a seminar on rain barrel gardening, a program that will provide information about how to collect rainwater and use it to irrigate lawns and gardens. Because I'm not the most informed person concerning conservation measures, this was a bit of news I'd never considered, even though I know that water conservation is important to preserving our water supply here on The Mountain. It seems that the water collected in a rain barrel could flow off the roof or through gutters on the roof and down downspouts into the barrel, then used to water non-edible plants like flowers or lawns. Mind you, the water you catch using this system is not potable. Sometimes water from the roof can contain bacteria from birds and animal waste that might be on your rooftop, and this would contaminate the water supply. Rainwater barrels were preceded by cisterns, which date back to antiquity and are frequently mentioned in the Bible. Ancient sites contain many cisterns, small catchpits attached to a private cistern and provided with an overflow channel leading to the cistern. Public cisterns were large rock-cut ones, and there were great water caverns used for water storage under the Temple at Jerusalem. Over one hundred years ago, Louisiana residents used cisterns to capture rainwater, and this system prevailed until yellow fever struck and a law was passed forbidding this natural water supply. Fines up to $1,000 were imposed. I remember that my paternal grandmother in Lake Arthur, Louisiana had a cistern house, as we called it, but it had been abandoned as a method of supplying water, and she had installed a toilet in the aboveground rainwater catcher. My old friend, Jimmy Wyche, Jr., now deceased, converted his aboveground cistern house at Belmont Plantation into an office and penned his famous "Letters to the Editor" in that space that had once been used for the plantation's water supply. For a long time I thought that Mehitabel, the alley cat featured in the poetry of Don Marquis, kept her kittens in a rain barrel, but when I read the book Archy and Mehitabel again yesterday I discovered that the feline residence was an empty garbage can in an alley behind a made-over stable in Greenwich, Connecticut. Mehitabel lamented that if a heavy rain came, the kittens would be drowned. However, a day later, following a heavy rain, when she was talking with Archy, the cockroach, and he mentioned Mehitabel's offspring and their home in the empty can, Mehitabel asked: "what kittens? " The humane ending to this poem was that the garbage can probably leaked. Let's hope so. And back to water scarcity, here's the "Cost of Water:"
the high cost of growing green lawns. in that one pig, snobby Tennessee town? Where do they get their rate scale? from the Water Commission of the Mohave? about your situation, your life there. where water isn't a problem. I counter Did you actually just say that? water rates are no criteria for culture. An important figure, dressed in black turtle neck sweater and black slacks who often stands in the background of my poetry readings is that of the "Dean of Poetry in Louisiana"—Darrell Bourque. Darrell, a cherished friend and former poet laureate of Louisiana, was recently named Louisiana Writer of the Year by the State Library of Louisiana and will be honored at the Louisiana Book Festival this fall. Most of us who enjoy his friendship know that he's a strong supporter of the literary arts, of both young and old poets and writers. Sunday, Darrell was among those gathered for the book signing of Porch Posts at Belmont Plantation in New Iberia, Louisiana, and I knew exactly where he stood, his poet's ear alert to the essays Janet Faulk-Gonzales and I had written and were reading to a gathering of approximately fifty people. 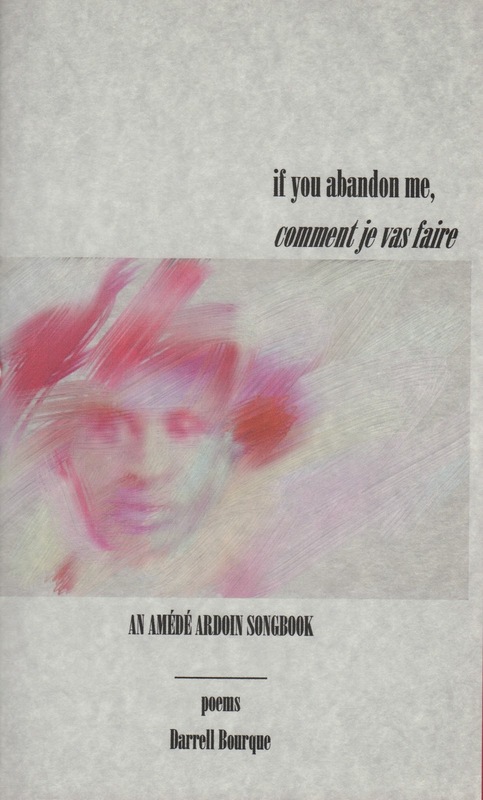 Afterward, I wished that I had asked Darrell to read one of his newest poems from a fascinating collection entitled if you abandon me, comment je vas faire: An Amédé Ardoin Songbook. The chapbook includes fourteen unrhymed sonnets about the early Louisiana Creole musician, Amédé Ardoin, who composed and sang songs in Louisiana Creole French and whose music inspired Darrell to write if you abandon me for the Louisiana Series of Cajun and Creole Poetry. This series was founded to highlight work created by exceptional poets of Franco-American descent, which includes Darrell's important contribution. Amédé Ardoin, a once-popular Louisiana Creole singer and accordionist, was a tragic figure in the Acadian music world. Ardoin, one of the first musicians to record Cajun music, was the victim of a racial attack in which he was beaten on a night some time between 1939-1940 after a performance at a house dance near Eunice, Louisiana. The legendary story is that white men who were present at the house dance became angry during his performance because a white woman handed him her handkerchief to wipe the sweat from his face. After he had finished playing and started walking home, he was run over by a Model A Ford, presumably driven by the irate white men. His vocal chords were damaged, and he lost his mind and his ability to perform as a musician. He was committed to the mental institution at Pineville, Louisiana and died there in 1942. Darrell was inspired by the recurring refrain of fear of abandonment or accusation that Ardoin is being abandoned in his songs. He explains that "the first part of the title is a play on his own words in the songs and the second part of the title is a version of another phrase, this time taken directly from one of the songs. The title is both in English and in French because that bi-lingual element remains an important part of Cajun and Creole culture in south Louisiana." While Darrell was composing the fourteen unrhymed sonnets in if you abandon me, he shared many of them with me through e-mails, describing them as "nonce sonnets," a name for the 14-line poem in which he used the same line/stanza form that he usually used for his sonnet writing: quatrain, tercet, tercet, quatrain, but the units were unrhymed. The last poem in the book is written in French and was a rhymed quatrain and a rhymed couplet that he called a "found poem," containing lines from Ardoin's songs. I loved the sonnet entitled "Ivy Lejeune Listens to Amédé," the last three lines cogently expressing the passion of early Louisiana Creole musicians: [Field work]..."was not for me either. Like him I couldn't see/anything but the songs. I walked like he walked./I carried my accordion in a sack to play. I caught/rides. Songs living in me said everything I knew." Each sonnet in this wonderful book is a tribute to early Louisiana Creole musicians who are being rescued from obscurity by contemporary Louisiana poets and musicians. if you abandon me is a small score of perfectly formed notes—notes that are clear, precise, and dazzling with the poet's passion for his native Louisiana Creole music. Darrell Bourque's voice is Amédé's voice come alive again.